Are you annoyed of computer making beep sound? Computer make small beep sound using internal speaker in the computer ( PC tower) case. Such beeps are used for diagnostic and troubleshooting purposes. If your PC is working fine, you do not need to hear these beeps. 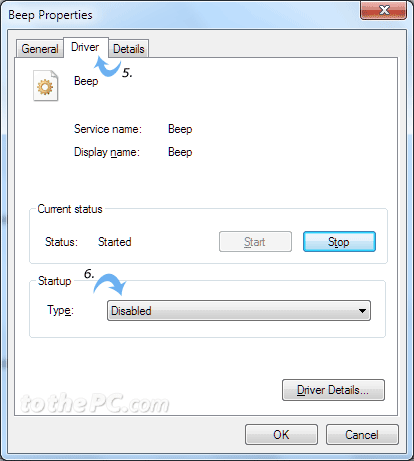 You can easily disable and turn off internal speaker beeps (sound) on Windows 7 using following procedure. 1. Click Start (Orb) button and type devmgmt.msc in the search box. 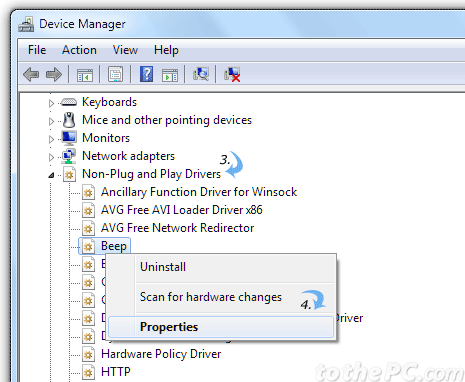 Press the Enter key to open Device Manager. 2. 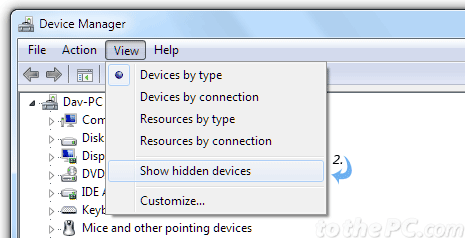 In the Device Manager window, goto View > Show Hidden Devices at the top menu. 3. Then double click Non-Plug and Play Drivers option to expand it. 4. Right click on Beep option and then click Properties option. 5. In the Beep properties dialog box, click Driver tab at the top. 6. Then change the startup type to Disabled using drop down box. Click OK to save changes. This should disable and turn off internal system beeps on your Windows 7 computer. You can enable beep sound again by changing the startup status to System from the drop down box.